On a Sunday morning the trendy district of Cihangir rarely gets going before noon. Today, though, at 6am everyone seems to be up. They’re on their way to polling stations, many to act as tellers or as monitors for Oy ve Ötesi (Vote and Beyond), an NGO determined to see fair play. 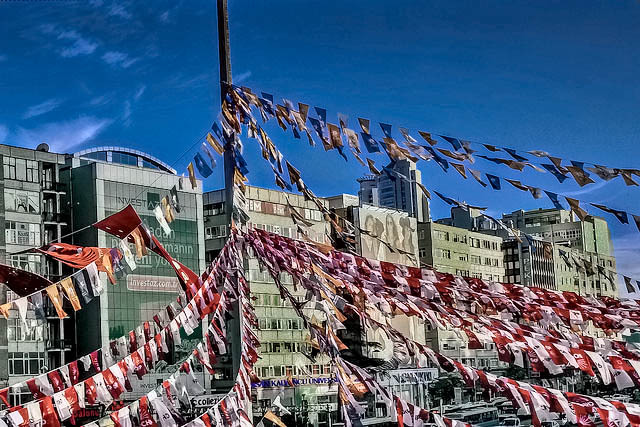 A minibus takes us up to Taksim and then down the hill to Dolapdere, a run down and impoverished part of Beyoğlu, on the edge of the Kasimpaşa district. Erdoğan country. Will his gamble to start a war with the PKK pay off? Will the pro-Kurdish HDP, who had given up campaigning weeks ago after almost 200 of their offices and bookshops were attacked on September 8 by the AKP youth wing (no arrests), get over the 10% threshold again? A 1970s primary school, 19 classrooms, each containing two polling booths, a transparent plastic urn, enough ballot papers and envelopes for 400 people, two devices with which to stamp the word ‘Yes’, a list of those down to vote in that classroom, and a long table at the front at which sit 5 officials. Or rather, one or two civil servants nominally in charge, and others – all activists – drawn from the main parties, an arrangement introduced in 2002 to ensure probity but in practice a recipe for bickering, points scoring and intimidation. Outside in the car park, groups of AKP and HDP youth hang about. Inside the foyer of the school a single desk is manned exclusively by AKP activists ready to help the infirm or the illiterate get to where they need to be and to remind them who to vote for (they can at least read the AKP’s logo, an electric light bulb). On the opposite wall a floor-to-ceiling silhouette in red of Ataturk, on either side of him his dates with the 8 from 1938, the year of his death, tipped on its side to suggest infinity. Oy ve Ötesi were established in 2013 after the Gezi Park protests. Erdoğan, the ostensibly neutral head of state, has described them as terrorists, and on election eve the government tried to bar them from entering any polling station. But the electoral commission (YSK) gave them the thumbs up, and so here we are, one for every classroom, along with a lawyer who knows the electoral law inside out. She will spend most of the day dealing with arguments in the classrooms. It is not long before she has something to do – all 19 voter lists which hang on the frame of the classroom doors have arrived without an official stamp or signature, and so someone from the YSK has to be called in, since without the stamp all the votes could be invalid. The same problem has arisen at all 122 schools acting as polling stations in Beyoğlu, funnily enough a stronghold of the Kemalist CHP. Before long more senior AKP figures are shouting at us, albeit in vain, to get out of the building, while two groups of youths from the AKP and HDP, not a woman among them, are squaring up to one another in the foyer. Eventually they are ushered back into the playground from where, like the children they are, they keep a brooding eye on one another and lethargically prepare refreshments for their supporters. If you are one of the few HDP voters here you will get a cup of tea. If you voted AKP, it is lunch presented in a shiny rectangular box the size of your grandma’s continental selection. Policemen in plain clothes covered in shabby red tabards, nominally there to keep order, openly fraternize with the AKP people and carry the lunch boxes for them. Though registered to vote only once, at their place of residence, the police can walk into any polling station and vote by showing a piece of paper called 142 to the chair. Polling is brisk, the voters are orderly, but they invariably meet someone they know and so there is a lot of hanging about in the corridors which adds to the febrile atmosphere created by activists from all parties constantly moving from one classroom to another. At one point a local candidate arrives mafia-style with an entourage of blue-suited roughs. Entering one classroom he announces that he is from the CHP, whereupon the AKP member at the table jumps up to tell him – rightly – that he is forbidden to identify his party affiliation; he in turn is slapped down by the chair: she knows the rules too and it is her job, not his, to keep order. In another an AKP guy brings sandwiches to his colleagues sitting at the long table, and in the day’s only display of bipartisanship is rebuked by another AKPer: go and get sandwiches for everyone. The police aside, the real fear of Oy ve Ötesi is not that voting will not be free and fair, nor that the counting will not be; it is that the voting figures, entered by hand on a piece of paper, have to be taken in a van along with the completed ballot papers, to an election coordination building where the results will be entered into a computer by a human being sitting at a desk. Who gets to sit in the van with the results and the bags of papers to ensure that the figures are not altered? Who gets to stand over the person entering the figures to ensure they are correct? How do we know that all vans arriving at the main building have come from genuine polling stations? And this time there is a further twist: the clocks were supposed to go back an hour last weekend as they did everywhere else, but the Turkish government decided arbitrarily to keep to summer time until after the election. Since they didn’t tell the nation’s computers, when the polls close at 5 o’clock the computers will think it is 4 o’clock. Nobody in the opposition parties can work out how the AKP could make anything of this, at the same time nobody can believe it wasn’t done for nefarious purposes. As the real-time 5 o’clock approaches and voting winds down, the activists turn their attention to the counting, to one another, and to the business of who gets to accompany the chair with the paper and the papers in the van. The answer is comically simple: one of the tabard-clad policemen goes from room to room and draws lots. In each classroom, when the committee sitting at the long table is ready, the sealed envelopes with the completed papers are counted onto the table and counted back again into the urn. One person opens the envelopes and the chair stretches her arms wide to display the full length of the ballot paper and announce which party has got this person’s vote. The tellers and activists and observers tick off the numbers on sheets covered with columns of numbers up to 400, every so often agreeing on the figures so far. There are 335 papers, and counting takes until 7pm. The AKP get 217, the CHP 70, the MHP about 35 and the HDP 6. None of this is surprising in this area but even so the AKP guys are constantly poking their noses in at the door and making suggestions to the chair, who on more than one occasion tells them to clear off. From time to time shouting and screaming can be heard from other classrooms, suggesting more robust debates about procedure. When the counting is done the chair, tired after holding aloft the ballot papers, and now sitting down while the AKP guys circle about the table, has to ensure that each member of the committee gets a copy of the hand-written scores, that every copy is signed by all those who have kept the score, and that these are entered into the official ‘album’ which will accompany the bag of ballot papers. Oy ve Ötesi members insist on a copy for themselves – a copy of the true result for each urn – so that they can enter the scores into their own computer and detect discrepancies between these and the official results. When we have finished 5 of the classrooms are still at it. There is no sense at all that things are being run solely by designated civil servants; as we leave an activist climbs into the boot of a van, curls up with a bag of ballot papers, and is driven away.